The Graduate Employees Organization is the labor union that represents more than 1,400 Teaching Assistants and Graduate Assistants at UIC.. The GEO is a democratic union run by and for its members. The GEO GEO is affiliated with the Illinois Federation of Teachers (IFT), the American Federation of Teachers (AFT), and the AFL-CIO. 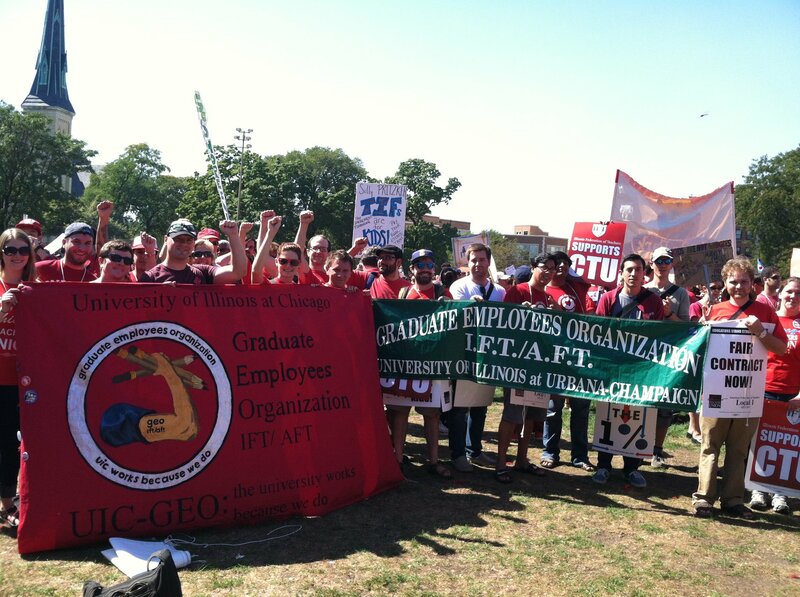 Through GEO, graduate employees at UIC negotiate directly with the UIC administration about tuition waivers, pay, workload limits, health benefits, paid time off, and much more. Run by an all-volunteer Steering Committee, the GEO is your voice at UIC. On March 2nd, 2016, GEO ratified a new contract after many months of negotiating. The current contract cycle is August 2015 to August 2018. The minimum wage was raised $700 in 2015-16 (raising the minimum to $16,765), $700 in 2016-17 ($17,465), and $600 in 2017-18 ($18,065). The previous contracts had raises of $500 each year. The University contribution towards Campus Care fees will now be $250 or 40% in 2016-17 (whichever is greater), and $275 or 40% in 2017-18. The new contract includes one paid personal day per semester, which we did not have in the previous contract. We gained increased protections under our nondiscrimination clause by adding “gender identity and gender expression” and “pregnancy” as protected statuses. We were able to change the language throughout the contract to include gender neutral pronouns to make sure the language of our contract represents all of our members. Lastly, we added a way to address consistently late course assignments and a few tools to address concerns with the university between now and the next bargaining cycle. Throughout the bargaining process GEO held collective actions and would not have secured this contract without the drive and determination of its membership. There are a number of way that you can get involved: become a steward, research items for our next contract, submit a blog, attend GEO events, or whatever else you might be interested in or skilled at! Want to know more? Email us at geo@uic-geo.net to get involved!